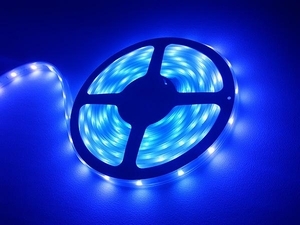 Komply™ UV5050 is an IP65 rated 12V flexible LED ribbon that has 30* UV LEDs per meter on a 5-meter roll, and is a wonderful architectural LED lighting solution for numerous indoor or outdoor applications. There are cut points every 10cm (between every 3 LEDs), so no matter what length the situation calls for, you’re sure to get a great fit! Like all of our Komply™ ribbon products, you’ll need to give it power. The UV5050 ribbon consumes 7.2W per meter (36W per full reel), so with our 150-watt Komply™ POW150, you can power up to 3-4 full rolls. If your installation is in need of a power supply with even more wattage output, we also offer a 300-watt version with the Komply™ POW300.